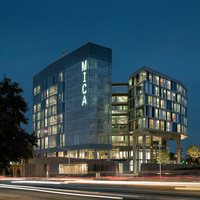 MICA’s newest residence facility, Gateway, which serves as the entrance to MICA’s campus and the arts and entertainment district of Baltimore, opened in August 2008. Gateway includes three and four bedroom student apartments as well as studio spaces on the second through seventh floors. Student Space Galleries are on the first floor across from the BBOX, a black box theater used for a wide range of performances, including the Coffeehouse Performing Arts Series and productions such as HAIR created by MICA's Rivals of the West theater company. Gateway Cafe, also located on the ground floor, serves light fare and beverages as well as ice cream with toppings of your choice. The Joseph Meyerhoff Center for Career Development, located on the second floor of Gateway, is a one-stop resource for students preparing for the leap into the world of art and design, alumni making a transition into their careers, and employers and institutions that would like to connect with MICA students and alumni. This event was fun! Large parachute was so cool. Ran out of cake in 10 min. :( With over 80 people in attendance Bones Birthday was a huge hit! Everyone seemed to be having fun. Good music and free food!